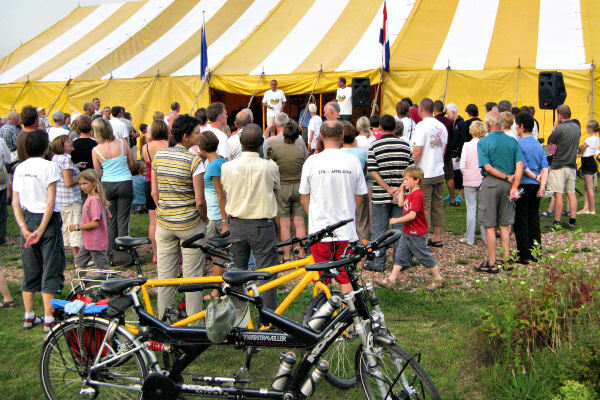 The International Tandem Rally in 2009 was held in Appelscha, Friesland from the 1st of August until the 8th of August at the RCN campsite deRoggeberg. We had a large field of our own, for caravans, campers and tents and some people rented houses located around the HQ. Appelscha is situated in the northern part of the Netherlands, on the edge of Friesland, Groningen and Drenthe. DeRoggeberg is located in the woods on the edge of the national park Het Drents-Friese Wold. 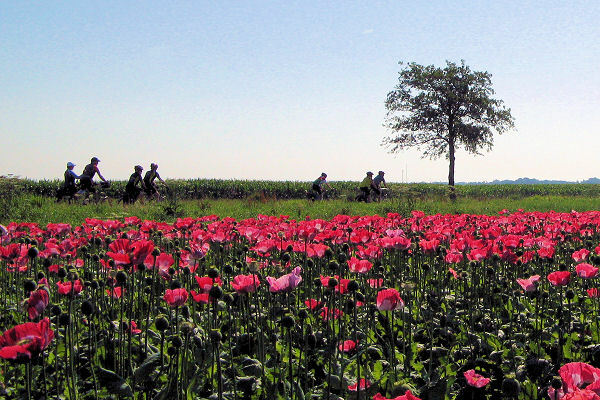 It is indeed a beautiful area for cycling with forest, moor, and farms. As normal we had short, medium and long rides. There were also activities for children. 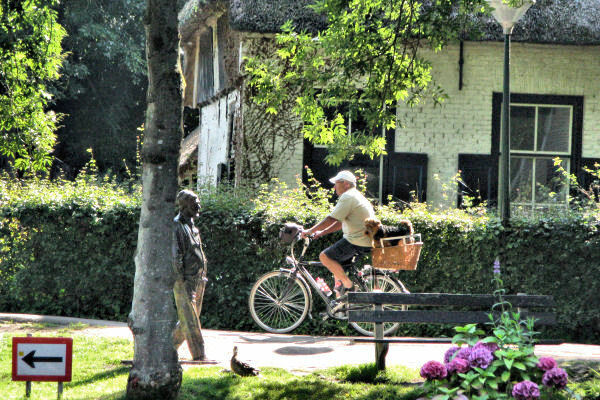 Wednesday was the day off when a coach outing to Giethoorn was organized. 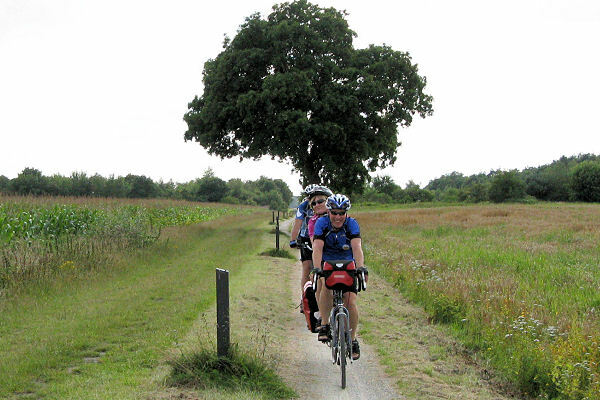 In the Netherlands bikes and cars are generally kept apart, in fact bikes have to keep to the cycle paths and are not welcomed on roads where a cycle path is available. For leisure cycling purposes this is wonderful but if you're actually trying to get from A to B it can be rather trying following the wiggly and lengthy cycle path route rather than the more direct road route. The cycle routes can be denoted by "nodes" (numbered routes), numbers on "mushrooms" (square things set low to the ground) or finger posts with town names: your eyes have to be everywhere to spot these various markers. The tracks are very varied, being on crushed shells, tarmac, concrete, block paving (some very bumpy!) and can be very narrow, needing great concentration when passing the "sure-wheeled" local cyclists breezing calmly by in the opposite direction. 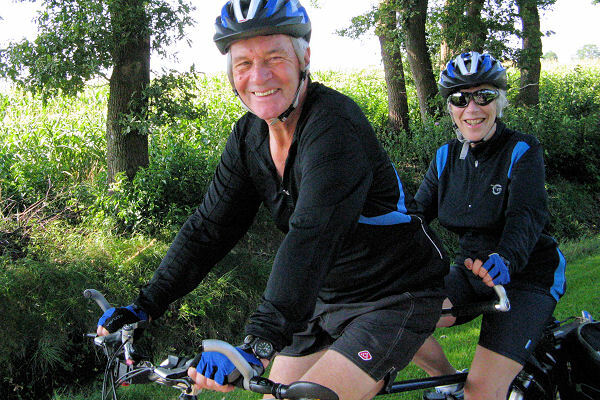 Cycling alongside the many straight canals is particularly pleasant. A steady stream of campers arrived to fill the large field allotted to the Tandem Club situated at one of the furthest extremities of the huge RCN de Roggeberg campsite. A very large yellow marquee had been erected and set up as HQ by our Dutch Tandem Club hosts and other willing volunteers. Our Week's Programme booklet informed us that "Organisation members are to be found under a "yellow baseball cap"" and sure enough there they were checking us in and distributing our packs, including a loaf of the delicious local speciality "Frisian sugar bread" wrapped in paper denoting the Frisian flag. At 20:00hrs we gathered in front of the marquee to be greeted by Jan Slagt, of the Dutch Tandem Club organising team, Koos Marissen, Director of the RCN de Roggeberg campsite, Janet Prichard representing the UK Tandem Club and finally Jan Mastwijk, Member of Parliament for Christian Democrats and a keen cyclist - he was accompanied by a very pretty young lady wheeling a tandem - after downing a shot of the local alcoholic drink he declared the rally officially open. The proceedings were accompanied by music from a very attractive fairground organ (not too loud either!). Tjonger route: It was unfortunate that rallygoers were greeted by rain for the first day of cycling but determined tandemists reported to the cheery couple of ladies sited under a large umbrella at the exit of our field and received a large local apple each, to sustain us on our travels. 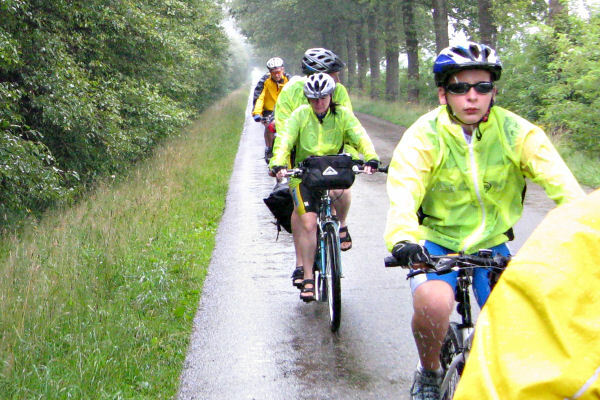 We set off in gentle drizzle on cycle tracks through the Drents-Friese Wold National Park in a westerly direction to later loop north. A climb up the watchtower in the Aekingerzand afforded a reasonable view of the moorland and sand dunes. The correct apple pie and coffee stop was found in Boijl and was very good but unfortunately the route turned right just before and in the poor weather it got missed by the majority of the tandemists much to the upset of the lady owner who'd been up since 08:30hrs waiting for our custom. The medium route went to Donkerbroek where there was a timely placed restaurant to shelter in and enjoy lunch whilst a very heavy downpour occurred outside. Emerging onto the very wet and flooded roads and rather mucky tracks but with no precipitation we continued, riding alongside the Tjonger river, to the next refreshment stop at a Nature area set beside an attractive lake with fountain. On our return to the campsite and after welcome showering of bodies and cycle sandals to remove most of the accumulated cycle track sand, the sun came out and we were gathered together for a group photo taken by a man standing (with permission) on a conveniently parked ancient bus turned campervan. During the evening a film was shown of the 1996 International Rally held at nearby Borger and "spot the people you knew" was played by those watching. Koningsdiep route: Starting out past the ladies under the umbrella, we again received "goodies" for the day - this time it was Snelle Jelle kruidkoek (ginger cake). This ride took us north west through woods and heather moors to Haule for coffee and apple pie. It was then on to Bakkeveen, where several tandemists availed themselves of the restaurant for lunch whilst others enjoyed the good weather and picknicked along the way; back via Wijnjewoude to return to the campsite. After showering and eating we were entertained in the marquee by a Frisian dance group, Snitser Skotsploech, who performed various traditional square-dances, finally inviting members of the audience to join in with them. Hunze en Aa route: The Cycle 4-days of Appelscha started today (a very popular local cycling event) so, in order to avoid the crush, our route took us north east into the neighbouring province of Drenthe after collecting our daily rations on the way out. We'd also noticed that if we got back to camp before 18:00hrs there'd be a surprise! It was nice to be able to go into Assen to have a look around the shops, cafes and museums, with a children's animal farm on the way. There were lots of "catering" opportunities on the route but, being such a hot and sunny day, it was a perfect day to find a shady picnic table at which to enjoy a picnic, followed up (later) with an ice cream stop. We also stopped to look at the Hunebed (dolmen stones) in the forest near Schipborg and were surprised to see some more by the roadside, amongst houses, near Tynaarlo. Homeward bound was quite a hard ride along two long stretches into a south-westerly wind. On arrival back at camp the promised "surprise" was particularly welcome - a mobile Poffertjes kitchen had been set up outside the marquee and everyone was allowed one tray each of these delicious little pancakes being cooked in front of us - yummy! Whilst eating these in the sunshine outside the marquee we could watch people trying out the various recumbent tandems which had been brought along by Altena, with especial interest in their back-to-back tandem. Later the "Bring and Buy" cycle jumble sale took place in the marquee for people to get rid of their unwanted cycle bits and promptly buy some more! or a coach trip to the "Venice of the North" Giethoorn in the province of Overijssel with a boat trip along its canals and a wander around this fascinating place. On disembarking from the coaches we were told to hurry back to HQ as there was a surprise awaiting us which would not last long - we did as we were told and found that ice creams were being handed out to cool us down - we understood why we needed to get there before they all melted! Midden Drenthe route: Starting out past the "daily ration ladies", today we received bananas to keep us going. This ride took us east and south into Drenthe, past a witch museum, beside canals to Hooghalen where excellent waffles with raspberries and cream were enjoyed at the Bakker Feldderus. Later we rode through the working museum village of Orvelte with its sawmill, clog maker, blacksmith and many other olden-day occupations. We returned via Dwingeloo and a welcome stop at a bar for a cool beer whilst watching many other tandemists pass on their way home. Back at the campsite later that evening the "Dutch Games" were held which involved the stoker having to claim 4 rings onto a pole whilst being ridden past each one. 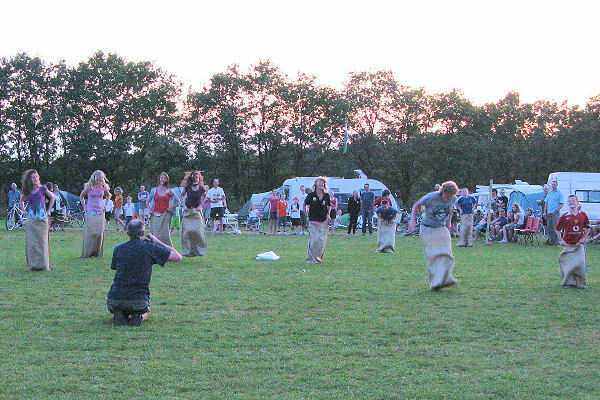 This was followed by a frenzied series of sack races (not on tandems!). Lindevallei route: We had big apples again for our last rations of the week and then we were off via Appelscha for a south west loop to ride alongside the very pretty Linde River - a perfect location for picknicking. 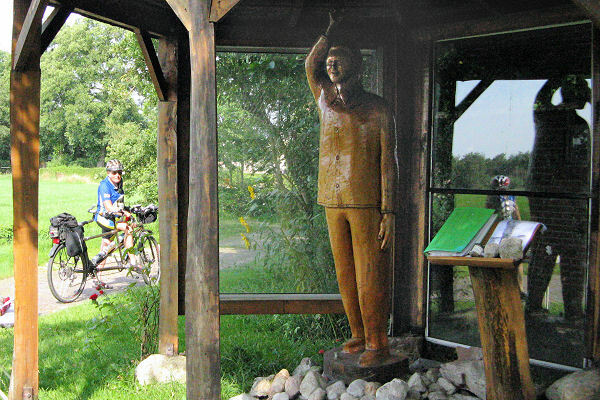 On the way we passed the rather strange life-sized wooden carving of Nelson Mandella under its protective glass sided pagoda outside a private residence and then spotted the morning coffee and apple pie stop set just off a busy road junction before Oldeberkoop. After lunch we arrived in Noordwolde with its Windmill Museum and shops and took advantage of a campsite cafe just outside Zorgvlied for a cooling beer. From here we went back through the Aekingerzand and went up the watchtower again to see if the view had improved from the rather murky one on Sunday - it was clearer but there wasn't a lot more to see! The day and rally ended with the traditional farewell barbecue. There were some very fancy barbecues being sported: an excellent troubadour sang to us whilst we ate in the evening sunshine, with the threatened rain holding off. "Thank yous" were said and gifts given to the excellent Dutch rally organising team for putting on such a good week of entertainment and rides for us all to enjoy. The best rally nameplate prize was won by the Rickard family - they'd cycle camped to the rally and had stuck a hand drawn and coloured picture of the area to a carboard box obtained from the campsite shop. There was a number of other very good efforts with even a miniature "ordinary" garden ornament being brought all the way from England and suitably decorated. The tents and awnings were down and stowed away before the light drizzle began to fall, goodbyes were said and the field emptied amazingly quickly with people making their way to catch ferries and to other destinations. And so another very enjoyable rally was over though, unfortunately, there is not one to look forward to in 2010 as no volunteers have come forward - what a shame.